Here is a glimpse of the project I am working on. I have all the blocks that go across the bed joined. (you can see the thin joining sashing.) There will be joining sashing between each row when it is finished. For now, the rows are just laid across my (yikes!) unmade bed (hence the lumps!) Still you can see the fabrics and the somewhat randomness of the piecing. Now I will eat lunch and finally hit the showers! The quilt project will get a rest since I am going to visit with the Nana. Your quilt look good. I think i have been on your blog before. I left a comment on your new sewing machine. That was some time ago. I love all those bright colors! There is no way you will over-sleep in the morning when you wake up and see that quilt!!! It's TERRIFIC...and how nice to be able to get it ALL done by yourself, too! 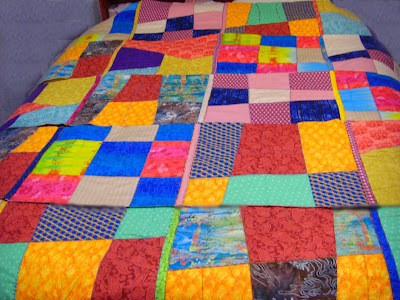 Your quilt looks like your art. Way cool, I love it. In the morning (I will still be in bed, will be my night) hop on over to my blog, I have something for you.